Today we travel all the way to Persia for a tale of assassination, when two condemned men made an audacious try for freedom. 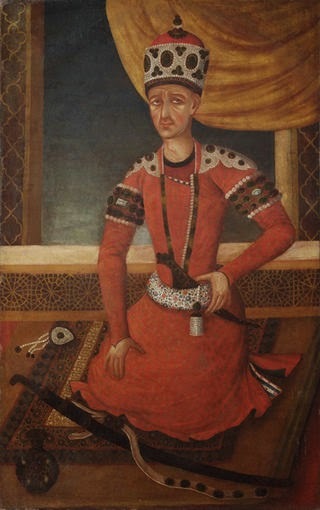 Just three years after replacing his murdered father as Shah of Persia in 1794 and following a string of military victories, Agha Muhammad was also destined to die by violent means. On the night of his death Agha Muhammad was resting in Shusha, the fearsome ruler anticipating no trouble and looking forward only to a peaceful evening. Legend has it that he ate half a melon and ordered his servants to safeguard the remainder, warning that, should they eat any themselves, they would be punished with death. As the night drew on, one of the servants grew so hungry and tempted by the fruit that he ate a segment and, in fear of Agha Muhammad's legendary wrath, killed him to escape punishment. In fact, the truth is probably far less colourful. As Agha Muhammad retired for the night two servants, Sadeq Khan and Khodadad-e Esfahani, got into a noisy argument within the shah's earshot. So loud did the quarrel become that Agha Muhammad lost his temper and ordered that both men be executed. Despite the efforts of Sadeq Khan-e Shaghaghi, a notable emir, the shah would not be persuaded to lift the sentence and agreed only that it could be postponed for twenty four hours until after the forthcoming religious holiday. The two condemned men were returned to their duties and with nothing to lose, decided to take matters into their own hands. With the help of fellow servant, Abbas-e Mazandarani, they stole into Agha Muhammad's chambers and stabbed him to death. Helping themselves to the shah's crown jewels, they fled for safety and Agha Muhammad passed into history. What a colourful tale and I'm not sure which version I prefer! I think I like the melon version, it's pleasingly out there! Guess it doesn't pay to get the servants mad at you. Especially if you're expecting them to work their notice! Surely the Shah could have afforded a fresh melon? A Persian at the Court of King George 1809-10. Very interesting reading!